An endless stream of water has flowed down the nearby Yamaska River since that fateful day, on September 26, 1950, when the new garage opened by Aurel Letendre on rue des Cascades, near the Bouchard bridge, served its first ever customer. That moment also marked the foundation, in Saint‑Hyacinthe, of a major family business that continues to grow and prosper throughout the South Shore region! 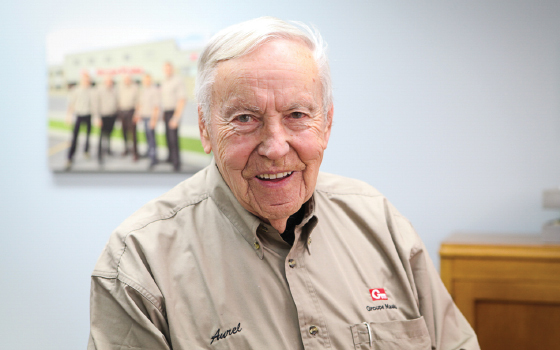 Aurel Letendre arrived in Saint-Hyacinthe in 1945, at the tail end of the Second World War, where he was hired as the head mechanic at Concorde Automobile, a GM and Cadillac dealer. After five years, he was confident that the sector would develop to the point of being able to sustain a business specializing in motor tune-ups and electrical systems. He married Monique Leclerc in 1949, soon after which the couple welcomed son Roger in August 1950, making the decision even weightier. Aurel also had to find financing and a location for his new business. Definitely not short on work ethic, he was convinced he would succeed. Those who knew him well knew he didn’t need help from anyone in that department! The problem of where to open the business was resolved when a 1,144-ft2 (22 x 52 ft, 106 m2) former machine shop on rue des Cascades was put up for rent by the owner, Victor Saint‑Amand. On the financial side, a $900 loan enabled Aurel to buy an old army Jeep, which he repurposed as a utility truck. He bought his equipment ($4,000) and materials ($6,000) on credit, a burden he decided he could live with, convinced it would only be a matter of time before he could repay the loan—which goes to show how confident he was in his decision! Aurel had analyzed the market accurately, because just three weeks after opening, he had to hire three men to help him keep up with the demand. And before the year was out, the garage would have five full-time employees, working morning to night. The working conditions were not always ideal: “We sometimes had to work outside,” recalls Aurel, “either because the vehicle was too big for the garage or because there was just no room!” This was definitely a challenge given our climate, and there was no option to expand because of the homes and warehouses, including manufacturer Fenêtres Cayouette, located on the corner of Cascades and Vaudreuil. One year later, a space became available at 540 Vaudreuil, an L-shaped building with an additional 1,560 ft2 (52 x 30 ft, 145 m2) of surface area. Then, in 1953, Aurel bought the property located at 550 Vaudreuil, a warehouse previously used by Gâteaux Vachon, adding 3,360 ft2 (42 x 80 ft, 312 m2) to his existing space. 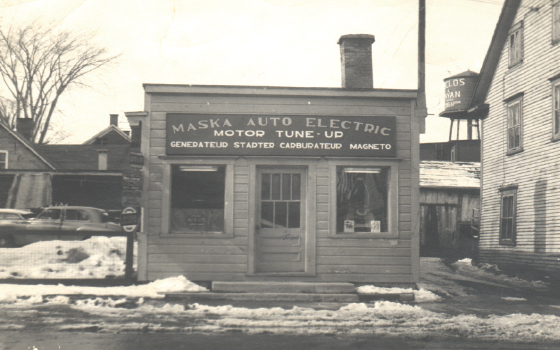 However, this new space was quickly filled up with extra equipment and materials after Maska Auto Electric (which became Groupe Maska Inc. in August 1977, subsequent to Bill 101) was named the authorized South Shore distributor for AC DELCO-GM in 1954. Under this contract, Aurel’s business was responsible for supplying GM dealers and independent garages with the electrical parts needed for tune-ups. Then, in the late 1960s, Fenêtres Cayouette moved to the industrial park, freeing up a 4,550‑ft2 (65 x 70 ft, 425 m2) warehouse that we rushed to buy to meet our growing need for space. And the move was a quick one—virtually all we needed to do was make a hole in the adjoining wall! The final expansion was achieved through the purchase of former tanners Duclos et Payan. “The building where they worked the leather was in good shape, but most of the yard was riddled with pits used to treat the skins. We had to do a major clean-up and fill in all the pits. Not even the water tower remained standing! A little dynamite in the right place and it was ancient history,” recalls Aurel. Again, a hole in the wall was all it took to move into the new space, which was fitted out to meet the needs of the new diesel and emergency generators departments. In the early 1990s, warehouses were built (11,136 ft2 or 1,035 m2) to hold heavy equipment (motors and generators), and in 1998, 12 additional service bays (12,500 ft2 or 1,161 m2) were built for diesel trucks, for a total of 16 out of 22 bays. Finally, an adjacent space was adapted to hold automotive paint products, rounding out the Groupe Maska facilities in Saint-Hyacinthe. After a land exchange negotiated with the City, Groupe Maska owned 75,000 ft2 (close to 7,000 m2) of buildings and warehouses, on a total of 180,105 ft2 (17,051 m2) of land. The business did very well in Saint-Hyacinthe. Each winter, Aurel travelled to Anderson, Indiana (home of DELCO Remy), to take specialized courses in order to stay on top of the rapidly changing automotive industry. On his return, he would pass on his new knowledge to his customers, for example, in the case of generators being replaced by alternators. “Of course, these were two very different parts, but they did the same job,” remembers Aurel. This activity sector peaked during the ice storm of 1998, when, for close to a month, most of the Montérégie region—Groupe Maska’s immediate territory—was plunged into total darkness. The company was called upon to meet a wide variety of needs (industrial, institutional, commercial, residential, etc. ), as well as perform a steady stream of repairs on emergency equipment that had never before been used so heavily or for such an extended period of time. A team of 35 mechanics specialized in gas, diesel, and natural gas motors were at the ready to serve customers. In addition, a number of generators were installed on trailers that were made available for rent. During the 1960s, the development of diesel engines led to the addition of an injection facility (1968), where we repaired diesel fuel pumps and injectors using leading-edge technology that has continued to evolve ever since, such that this facility is now the most advanced in the province. The quality of our staff and facilities is recognized across the industry. In 1971, when we started repairing entire diesel engines, major companies such as Detroit Diesel, Caterpillar and Cummins made us their authorized representative; not only did we repair their machinery, we also honoured their product warranties. Other manufacturers followed suit, making Groupe Maska the only business of its kind in Québec. While Groupe Maska has been operating at full capacity since day one, its diverse operations were not all-consuming for the head office. 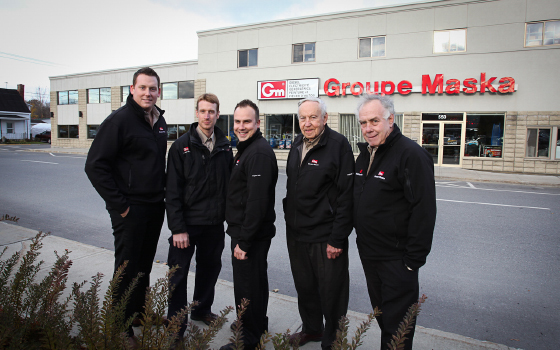 Since his fondation at ST-HYACINTHE (main warehouse and head office) in 1950, Groupe Maska inc. never stop to grow. Indeed, GRANBY (1965), SOREL (1969), DRUMMONDVILLE (1970), COWANSVILLE (2001), BOUCHERVILLE (2011) and WATERLOO (2015) are all proud members of the whole Groupe Maska family. In each of his locations, Groupe Maska branches strives to develop expertise tailored directly to the economic and industrial activity of its specific region. All products sold by Groupe Maska are available at the franchises; however, when it comes to diesel engine and generator repairs, they act as simple branches. In other words, customers can pay for services and drop off parts to be repaired at the franchise, but the work is done at the main shop in Saint-Hyacinthe. To this day, the seven franchises are buzzing with activity. The strong growth and the dynamism oblige use to constantly have to make numerous enlargements and reorganizations in the various stores, let us think of Granby who, recently, tripled in surface during the last construction. Groupe Maska has been a family business since the very beginning, which is obvious in the important administrative role played by Monique Letendre (née Leclerc). When the couple’s two sons, Roger and Pierre, were growing up, they spent a lot of time at work with their father, learning the basics of automobile mechanics from the best. Their teacher knew everything there was to know about mechanics; the garage was their playground.